I count myself lucky to have some really talented and generous friends. 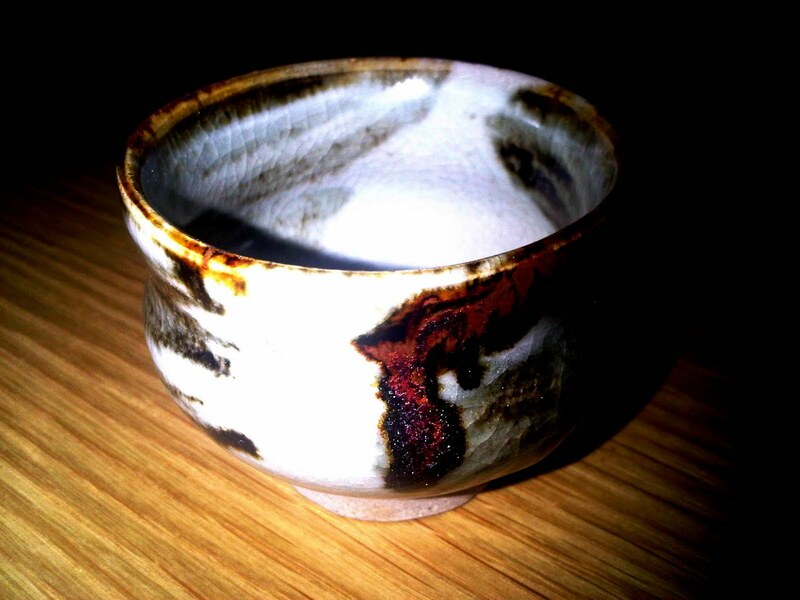 This Japanese sake cup was made by my very talented friend, John Freeland of Freeland Gallery in Sydney. John is an authority on ceramics, an academic and author and now a potter as well, having finally turned his theoretical expertise into the practical aspects of potting as well. And in his generous nature, he gifted this to me, knowing very well the types of colours I am fond of in pottery. I love the shape of this cup, the glaze and the beautiful colours. I love how the imperfect mouth of the cup and the slight tilt of its body make it so perfectly wabi-sabi although John shushes me every time I describe anything as "wabi-sabi". I don't drink sake but I drink lots of Chinese and Japanese tea. I plan to be using this cup a lot to enjoy drinking my tea in "melancholic serenity" and with a "spiritual longing" in true wabi-sabi fashion. I am such a deep and unsuperficial person. 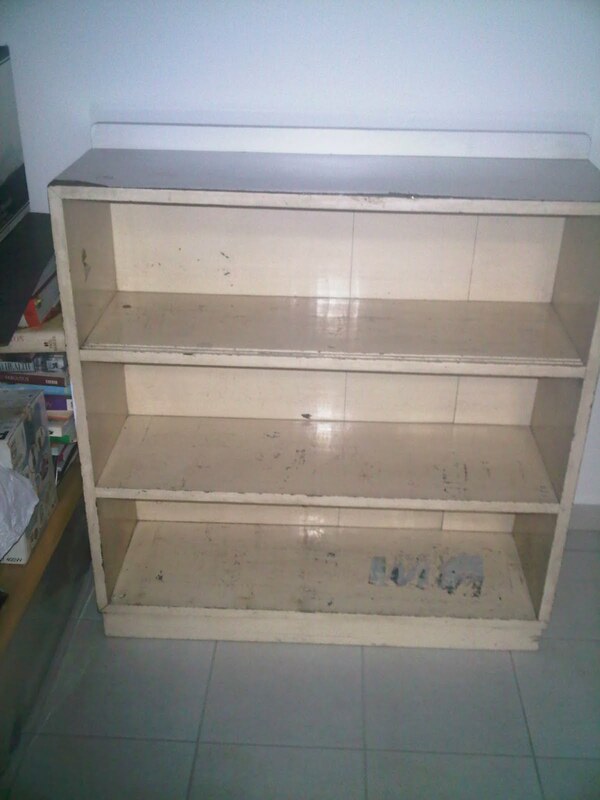 OK not completely true but I must say the picture of the 1970s book case here will evidence my lack of superficiality. This is a heavy wood book case, not sure if it is teak but it sure is heavy. The finish is really bad with remnants of magazine covers stuck. The top has a veneer that is peeling off. But we were looking for a book case, preferably vintage, but were also considering an Ikea one which turns out to be way too HUGE. This one cost us all of $30, it fitted into the car so no extra transport costs needed and seems like a good size for what we need. We figured we could easily make it more presentable by peeling off the top veneer. The rest of the paint needs to be stripped off and when we get to the bare wood, we could decide what we want to do with it. 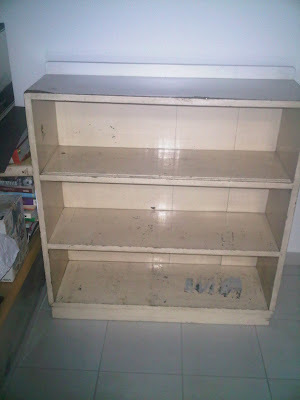 G is now saying that we don't have to strip the paint, just give it a wipe and put books on it. At most give it a lick of paint. That's how unsuperficial we are. Finally made my first 2 loaves of no knead bread. The first loaf was so delicious that I had a request from G to make another one that night when the boys finished the whole loaf with cheese, olive oil and fig vinegar while watching the rugby. The only thing was the loaf did not rise big and round when I put it into the oven. The yeast worked when I let it rest overnight for 18 hours and the second "nap" of 2 hours. But it came out to be a relatively flat loaf. I am wondering if I had not used enough flour as I followed the metric rather than the original imperial measurements. Ok a quick check using the online cooking conversion shows that it might be too much rather than not enough. So perhaps I need MORE yeast as well? 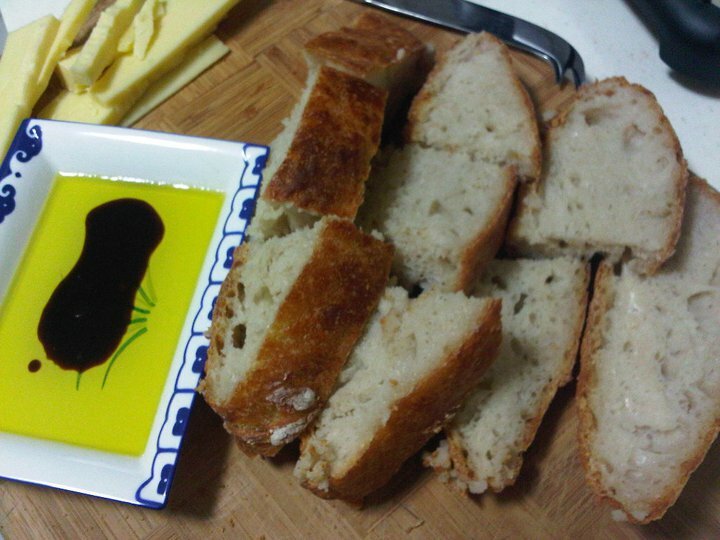 Anyway the flatness of the bread did not detract from its yumminess. The second loaf was more sourdough than the first, with a much more chewy and wetter texture. It would probably be delicious toasted too. Something tells me I will be baking this bread very often. Soup goes with bread without saying of course. After resolving to put my new Le Creuset dutch oven to good use soon, I was thinking of making soup to go with it and invite some ladies over for Saturday lunch soon. A very simple yet healthy lunch of rustic home-made bread with carrot and ginger soup perhaps with a dollop of sour cream. 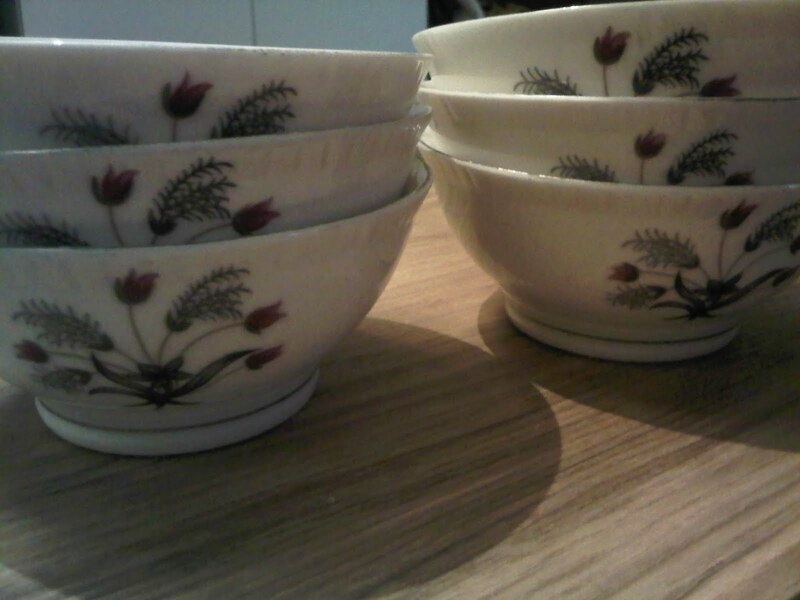 So when I found these 6 vintage little soup/rice bowls with the much sought-after local bunga lallang motif, I was really chuffed. I only have 4 Japanese soup bowls at the moment, 2 were lovely wooden lacquer ones which were a wedding gift from a Japanese-Australian friend, while I bought the other 2 plastic/mock lacquer ones from Daiso to make up the numbers for when we have guests. Now the stars are all aligned for me to get started on the home-made soup and bread-making with this half a dozen soup bowls. No more excuses.